There’s a thick magnet in the base of the mirror, website like this information pills two smaller ones with their poles pointed counterclockwise to each other in her base. 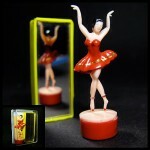 Push the mirror towards her, she pirouettes away. I scoffed at these things, visit web which used to appear alongside ads for X-ray spectacles, prostate sea monkeys and GRIT on the backs of Marvel comics when I was a kid.